At an informal dinner in Nova Scotia last July, the spy chiefs from the Five Eyes intelligence alliance – the U.S., U.K., Canada, Australia and New Zealand – met to map out a systematic campaign to blunt the creeping Chinese dominance of future global communications. Since then, each of the Five Eyes, as well as Japan, has announced new measures to block Chinese tech giants like Huawei and ZTE from selling fifth-generation, or 5G, wireless technology. Several European countries are debating whether to follow suit. Authorities in Poland arrested a Chinese employee of Huawei (and a former Polish security official) on espionage charges, raided the company’s local headquarters and raised the possibility of backing out of a year-old partnership with the firm to build 5G infrastructure. Last week, U.S. lawmakers introduced a bill that would bar Chinese telecom firms from buying U.S.-made chips and components. And last month, Canada arrested Huawei executive Meng Wanzhou, the daughter of the company’s founder, at the United States’ request over her alleged role in facilitating violations of U.S. sanctions on Iran. The U.S. filed sweeping criminal charges against the company on Monday over the Iran issue and allegations of technology theft from U.S. firms. The timing of these events is hardly coincidental. The decadelong race to build out 5G infrastructure across the globe will kick off in earnest this year. The firms that deploy most rapidly will reap the benefits, including increased market share, influence over global standards and licensing royalties, and a head start in shaping the ecosystems that sprout from the new technology. And since 5G tech will have far-reaching military and intelligence applications, the race will blur the line between the commercial and the strategic. Despite attempts to freeze them out, Chinese firms have immense advantages – ones that could help dramatically reshape the global geopolitical landscape. These features will require substantially more new infrastructure and, thus, won’t be rolled out widely until the mid-to-late 2020s. But they will have the biggest impact. Designers envision finely tuned grids powering “smart cities,” widespread adoption of industrial automation and 3D printing, artificial intelligence, augmented reality and highways packed with driverless cars, as well as massive, tightly integrated military operations involving swarms of unmanned fighter jets, submarines and surveillance planes in parallel with an equally intense cyber offensive. Defense planners and spy chiefs are cautiously optimistic about the opportunities 5G will introduce. The Pentagon, for example, reportedly believes the F-35, the B-21 Raider stealth bomber, the P-8 Poseidon ISR planes and the Aegis Combat System won’t reach their full potential until 5G’s throughput capacity allows them to function as “data monsters.” Samsung is partnering with the U.S. military to develop a prototype mobile 5G battlefield network, using drones as antennas, for places with poor satellite coverage. Communications can be tightly encrypted without diminishing connection speeds. On the flip side, though, there are fears that Chinese firms, at the Communist Party’s behest, could insert “backdoors” into 5G hardware, giving Chinese spooks unfettered access to sensitive communications or, at minimum, to the oceans of data being generated by the internet of things. The U.S. military, meanwhile, depends on complex logistics operations throughout the world, largely over commercial telecom networks. There’s concern that Beijing could simply turn off networks around U.S. supply lines just as the Chinese military is, say, making a move on Taiwan. Similarly, the more the U.S. economy is dependent on 5G ecosystems, the higher the risk that a cyberattack could grind the U.S. economy to a halt. But to the Five Eyes, at least, proof matters less than potential. It’s clear that no Chinese firm can rebuff Beijing’s demands for cooperation on weaponizing 5G. China’s 2017 National Intelligence Law made this power explicit (as if it wasn’t already). It’s also clear that China is poised to export its technology far and wide. Beijing has been preparing for the 5G race ever since the global rollout of 3G technology exposed the relative decrepitude of the Chinese telecom sector and its continued overdependence on foreign technology. In response, Beijing began focusing on dominating 5G intellectual property even before 4G/LTE had been widely installed, shoveling money into research and development and, notably, forcing Chinese telecom firms to collaborate as part of an industry-wide alliance with Chinese universities, arms makers and local governments. Since 2015, China has outspent the United States by some $24 billion in wireless communications infrastructure, according to Deloitte. The effort appears to be paying off; Chinese firms are expected to win as much as 40 percent of 5G patents, compared to around 7 percent of 4G ones. And the rollout of commercial standalone 5G infrastructure – what’s needed for the two features necessary to expand data-intensive applications – is expected to begin in China in 2020, five years before any other country is currently expected to follow suit, according to the Eurasia Group. The head start in field testing is likely to give China a considerable edge in development of 5G applications and exports. This illustrates one inherent advantage for Beijing: The U.S. government has long collaborated with Silicon Valley, but it cannot force U.S. firms to cooperate with it or with each other. (In fact, ample Chinese investment in U.S. tech startups has deterred public-private cooperation altogether in some areas.) Moreover, Silicon Valley isn’t equipped to stand up a full 5G network on its own, whether in the U.S. or abroad. 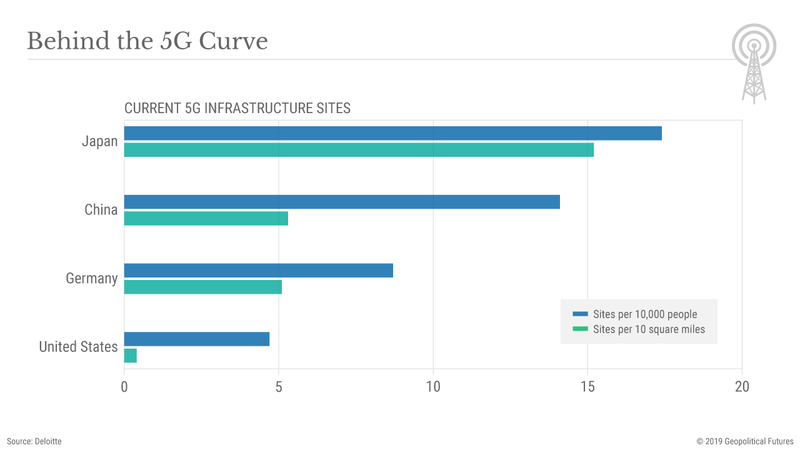 At present, for example, U.S. carriers will likely rely on Nokia, Ericsson and Samsung (all foreign firms, which themselves rely on other foreign companies for myriad components) for 5G radio access network hardware. By comparison, Huawei alone is competitive in network hardware, chip design and end user devices, making it the equivalent of Ericsson, Intel and Apple rolled into one. To be clear, the relative openness of the U.S. tech sphere has been a major strength, with competition among foreign and domestic private firms spurring breathtaking innovation. It’s doubtful that China’s state-managed system can ever be as dynamic (hence Chinese firms relying on shortcuts like mergers and acquisitions, tech transfers and commercial espionage). The flaws in the Chinese system will become more acute if the U.S. succeeds in cutting off Chinese firms from Western technology. As it stands, even Huawei and ZTE will still require some outside technology even for China’s domestic 5G systems. Still, the open U.S. system is laden with security risks and ill-suited for economic statecraft. The problem is serious enough that the U.S. government has reportedly considered nationalizing existing wireless infrastructure to develop a centralized, nationwide 5G network within three years – a program the White House is comparing to the development of the interstate highway system under President Dwight Eisenhower. A National Security Council memo leaked to Axios last January lamented that “China has achieved a dominant position in the manufacture and operation of network infrastructure” but added that the new U.S. system could eventually be exported to “help inoculate developing countries against Chinese neo-colonial behavior.” It’s hard to see the government taking on U.S. telecom firms in such a manner. But the memo illustrates the belief in Washington that, one way or another, the U.S. needs to be able to better harness its capacity for technological innovation for strategic aims. The U.S. campaign against Chinese tech ambitions is still in its early stages, and it’s an open question whether Chinese firms like Huawei could remain competitive without Western intellectual property. But as it stands, Beijing is poised to export its 5G tech more quickly, more cheaply and with more diplomatic support than Western firms – particularly to strategically important but less wealthy states, where the potential for Chinese malfeasance doesn’t carry as much weight against local development needs. This could have profound geopolitical implications. In general, peripheral states don’t want to have to pick sides in the escalating U.S.-China competition. They’d rather play the two sides off each other where possible. A strategically important country like Malaysia is happy to take aid and investment from China, the U.S. and Japan – or conduct maritime security drills with each of their navies. This reality is a major limitation on instruments of Chinese soft power like the Belt and Road Initiative; it’s too easy for participating states to keep their foreign relations in balance. But emerging technologies like 5G could force such countries to get off the fence. If the U.S. and its allies are unwilling to run military logistics networks through countries with any Chinese technology in their 5G systems, much less to expose sensitive military interoperability or intelligence-sharing operations to Chinese eyes and ears, it could substantially weaken the U.S. ability to sustain robust defense partnerships abroad. This would open opportunities for China to fill the void and extend its own military influence in places with the tech infrastructure needed for next-generation military applications. Countries like the Philippines, Vietnam, Thailand, South Korea and India are the battlegrounds to watch here. 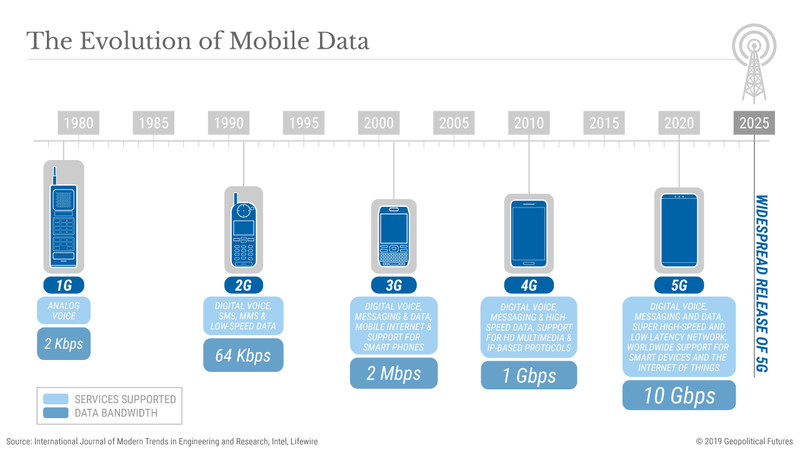 Of course, the 5G race may not end up being quite so zero-sum. New technological solutions may emerge that allow the U.S. and its allies to shield themselves from Chinese technology and do business abroad as usual. 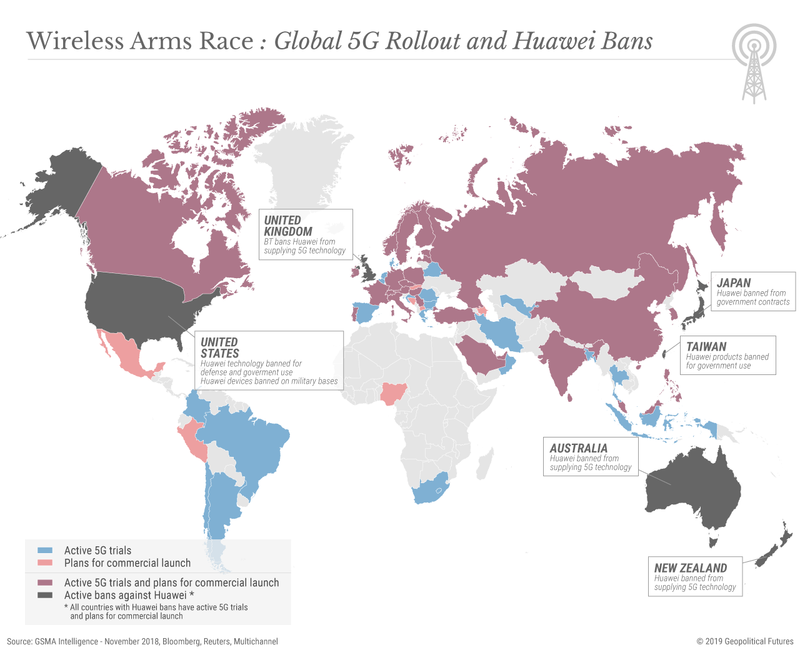 But at minimum, 5G will increase the odds that a world with discrete U.S. and Chinese spheres of influence takes shape. The U.S. and its friends are certainly acting like that’s what’s really at stake.